The Octavia has been one of our favourite family cars for some time thanks to the combination of quality, price and space which really puts it in a class of its own. The latest Octavia benefits from the new Mk7 VW Golf and Audi A3 underpinnings but can it still deliver its old tricks and undercut key rivals? The first clue that the Octavia is part of the Volkswagen Audi family is the styling. 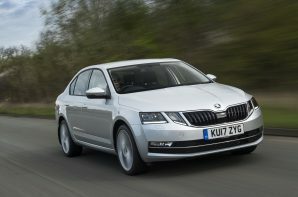 The Octavia’s look signals Skoda’s move from the budget end of the market to mainstream contender. As a result it looks Germanic, and particularly from the side could easily wear VW badges. It’s a mature look but it isn’t desperately exciting. The interior follows the same theme with a simple and unfussy design which is finished with high quality materials. The depth of engineering is clear and Skoda has done a great job at stretching the Octavia with 108mm more between the wheels whilst also keeping the weight in check. This results in very generous rear legroom and a massive 590 litres of boot space. In addition to being massively practical, the Octavia is also amazingly frugal when paired with the 1.0 litre TSI petrol engine and a manual gearbox. The combination of 148 lb. ft. of torque and a kerb weight comparable to big superminis also ensures that performance is not overly compromised. The Octavia continues to offer a unique proposition, thanks to the ‘fastback’ design you get a massive boot, and with a stretched wheelbase you get good interior space too, but it’s the price of a small family car. It achieves very good official fuel economy which leads to low company car tax and low running costs. If you want a no-nonsense family car the Skoda offers great value without compromising on quality.